The coastal part of the town has some fantastic sandy beaches, which even in the peak season are so big that they never get packed, and you can always find a spot away from the crowds to enjoy the sunny weather. Alicante airport is only 20 minutes drive away. We have a dedicated page on La Marina airport transfers which will help you get from the airport to your accommodation. La Marina is a small town in an area of protected pine forests and it comes alive during the summer months when people fill the town to enjoy the small but busy beach tourist resort. Clearly, La Marina is a great location for a beach holiday, if that is all you want from a holiday then you won’t need to go anywhere else, as everything you need for a great family holiday in the sun is right here in La Marina. Enjoy a traditional Spanish experience by visiting the street markets which are held every Thursday and Sunday from 8am to 2pm. Here you will find stalls selling local produce including fruits, vegetables, leather goods such as handbags, shoes, belts and purses. There is a choice of two airports to fly into, each being serviced by budget airlines. You can fly into either Alicante or Murcia airports each being about twenty minutes by car from La Marina/La Escuera. Ryan Air, Easyjet and Monarch have made Alicante and Murcia amongst their destinations to fly into. To the south of La Marina are urbanisation Bella Vista and urbanisation Las Pesqueras, then comes Guardamar del Segura, a much larger coastal town with great beaches. La Marina is a popular place where many people live all year round especially in the growing La Marina urbanisation which is slightly inland off the coast (and separate from the actual town of La Marina) and just off the N-322. It has plenty of shops, bars and restaurants so you have plenty of facilities on your doorstep that you can easily walk to. There are four supermarkets including SuperValue (the tourist office is opposite here). There is also a newsagent, optician, bank, Cornish Pride and an ice-cream parlour. In Spanish, the word urbanisation is urbanizacion and means a housing development. La Marina is broken down into three main areas: La Marina, La Escuera and El Oasis. The post code (in Spanish ‘códigos postales’)is 03170. You may also see it referred to as Marina Oasis and smaller parts include the blocks of Marina Sol, Marina del Mar 1, Urb. Jazmin, Urb. Oasis, Isla Christina, Lo Grane and Residencial Oasis. It is well-designed with plenty of parks and green zones where you can play football or walk dogs. The La Marina urbanization has all its own amenities, making it pretty much self sufficient, and of course there are a glut of rental properties in the area. There is a local bus service which will take you to the shops, bars and restaurants on the urbanisation. The Vega bus goes to the beach 2km away. A good option is to rent a villa with pool. This means that for most days you can simply laze by the pool, cook on the barbeque and make the most of the superb weather conditions that are enjoyed here throughout the year. With a car you will be able to get out and about and visit the numerous coastal resorts, as well as attractions like the Rio Safari park between Santa Pola and Elche. You can also get to local golf courses, of which there are plenty in the area. Don’t forget a trip into the city of Alicante where the best shopping area can be found. Likewise for culture, maybe a visit to the Santa Barbara Castle is also ideal. La Marina is surrounded by some charming little towns and villages such as Daya Vieja, Daya Nueva, Almoradi, Algorfa, Rojales, Formentera del Segura, San Fulgencio and Catral. All have been developed to a degree. If you are looking to buy property, there are plenty of villas and apartments for sale. La Escuera is one of the main parts of the La Marina urbanisation which all come under the council control (Ayuntamiento) of the small town of San Fulgencio. To book a holiday to La Escuera there are many villas and apartments to rent. You can also book a cheap flight either into Murcia or Alicante. On the La Escuera Urbanisation you can take advantage and eat out at the Bar Restaurant Partyda where you can sit outside on most evenings in their extensive gardens and enjoy your menu and sangria. Another restaurant close to La Escuera is Restaurante Los Pinchos. La Escuera is strategically located if it’s golf that you would like to play. Fifteen minutes away from La Escuera you will find the La Finca Golf Course with a new hotel and clubhouse where the Spanish Open is played. Twenty-five minutes away you will find the La Marquesa Golf Course, and Villamartin which has an abundance of olive trees and bunkers making it a challenging course for all levels of ability. Las Ramblas golf is a short course, very attractive with high trees, ravines and fairways make for a great golfing experience. Campoamor golf is spread over two valleys and has stunning views and a clubhouse to finish the day. To play at Campoamor you need to have a thirty-six handicap or less and you need to book a week in advance to be able to play. You can hire clubs and electric buggies at the course on the day. All courses have eighteen holes and putting greens and driving ranges. Restaurants and cafes are also located at the courses to refresh yourself after your round. There are two water parks both within ten minutes drive from La Escuera, in Quesada and Torrevieja Water Park Aquopolis. A great day out can be had at the Rio Safari park, located on the Elche – Santa Pola road. The park has a wide range of animals on display as well as swimming pools and water slides. There are also dolphin shows to watch. For opening times and prices you can call them on 966 638 288. El Pinet has attracted a lot of media attention over the last two years as having been started during the building boom which has gripped the Costas over the last ten years. It has looked like as the boom ran out of steam the unlucky investors and retirees would bear the brunt, but the developers have made good on their contracts and El Pinet is now open for business. 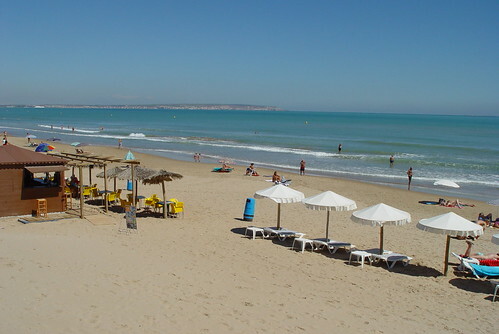 El Pinet is a new urbanisation on Spain’s Southern Costa Blanca close to La Marina. With a large amount of houses and apartments on complexes being built in 2009 and improving the roads and infrastructure, El Pinet has become a first class urbanisation to spend your vacations or winters at. The apartments are located on gated complexes with pools and many of them are available to rent at various times of the years as not all owners have made El Pinet their permanent residence. La Cuisine Address: 19 Avenida de Londres, Urb. La Marina, 03177 San Fulgencio. Tel. +34 965 501 991; Mobile +34 628 053 620. The La Marina urbanisation also has many different types of restaurant including Chinese, Italian, German, Pizzeria, Steak House and Fish and Chip Shop. La Marina is very small but the nearby La Marina urbanisation is a sprawling development with many apartments and villas which people have bought as holiday homes and so many are available to rent out. There are even many available for long term lets in La Marina. The La Marina Hotel is set in the centre of the town of La Marina close to all local amenities. The La Marina Hotel is a good choice if you are looking for accommodation in the La Marina area. Situated on the Costa Blanca close to the cities of Elche and Alicante and just a short drive from the airport, the hotel is easy to access and great for touring this popular area. The La Marina Hotel has 40 guest rooms, all with air-conditioning, TV, and mini-bar. The hotel has a nice restaurant and outside terrace for al-fresco dining in the nice weather. The La Marina Hotel is situated in Avenida La Alegria 30 and welcomes guests from all nations, to stay in La Marina on the Costa Blanca Spain. If you are passing through La Marina and need accommodation for a short stay i.e. a night or two, then our page on guesthouses in La Marina is exactly what you need. 1. Visit the inland town of Elche famous for its palms. 2. Go north and visit the major city of Alicante – it has great beaches and a fantastic marina. 3. The ancient and historic city of Murcia is not far from La Marina. 4. If you like history, nearby Rojales and Orihuela have old towns and cave houses. 5. Guardamar del Segura is a large coastal town just south of La Marina and is worth a visit. 6. Water Parks of Aqua-Park (at Rojales) and Aquapolis (at Torrevieja). 7. Safari Park at Elche (Rio Elche). 8. Acuario is an aquarium at nearby Santa Pola. 9. Go horse riding at Dolores. 10. Take a trip to the island of Tabarca (from Santa Pola). Address: Avenida de la Alegría, 72. La Marina. 03194. (Alicante – Alacant). Address: Camino de los Ruices, s/n. La Marina d’Elx. 03194. If you have found this guide on La Marina because you are thinking of moving to the La Marina area, you may also find our moving to Spain section with expat interviews and accounts of how they found their move to La Marina Spain, useful and informative. “Hi Mark, I must admit I was fascinated to read your story. Talk about similarities. I’m originally from Glasgow but I moved to Crawley in West Sussex (not too far from you) in 1976 where I only had 1 job which I loved and did very well in. Like you, a friend of mine came here to Spain on an inspection trip in 2001 and came back raving about the place. I always loved Spain so the wife and I booked 1 up with the view to buying a holiday home. Well 9/11 happened about 3 days before we were due to fly out and I can tell you we were both very nervous about flying but we came out anyway and absolutely loved it and put down our deposit and were so excited and we didn’t know how we were going to contain ourselves for the next 2 years. Anyway in May 2003 about 3 months before our villa was due to be finished our chairman called a meeting and said they were closing the company down mainly because of the demands of the Final salary pension scheme which the company could no longer afford. So after 28 years there and with a fantastic job and salary in a specialised industry I was now consigned to the Job seekers office and with a new villa in Spain to somehow find the funds for. To be honest the jobs I was offered didn’t pay one-third of the salary I was earning and I was in quite a panic as what to do. Then it hit me. Why not just sell up and go and live in Spain permanently and that’s what we did. So in December 2003 at the ripe old age of 53 I moved out here permanently with my wife and it was the best decision we ever made. I love it here and would never ever consider going back to the UK. The closing of our Company was the best thing that ever happened to me. I must admit I think you were very brave to come out here with such a young family. I don’t know if I would have done it. I live in La Marina about halfway between Alicante and Torrevieja but I must admit Javea sounds great. I might even look into moving there!! We also have a great interview from Jan who tells her story of her move to La Marina here in our Spanish expat section. Samantha, what would you say would be the advantages to living in La Marina compared to other Costa Blanca towns? La Marina is ideally located just a 25-minute drive to Alicante airport and is only a 5-minute drive down to the beach and without a doubt the best beach on the whole of the Costa Blanca which is a long blue flag award-winning sandy beach stretching for miles. We believe La Marina has something for everyone from small 1-bedroom terraced homes built in the 1980’s that are popular with people living in Madrid and using these properties each August for their annual getaway to brand new detached modern villas with private pools that attract the people from the Benelux countries and Scandinavia. Wherever you are in La Marina you are never too far away from a commercial area with bars, restaurants. Approximately 35 percent of properties are Spanish owned however a lot of property owners do use them as holiday homes. The area is perfect for experiencing an outdoor lifestyle, with lots of areas suitable for leisurely walks or hikes for the more experienced. Cycling is a very popular sport here too. The beach is just a 5-minute drive from the urbanization with a bus service available during the summer months. A personal favorite of mine is the Argentinian steak house just off the Consum square. There is a good choice of restaurants from Italian, Chinese, French, Dutch, Mexican, Indian, English and traditional Spanish to name just a few. Everything is here… schools, GP, dentist, banks, 5 supermarkets including an Iceland’s store, hairdressers, beauty salon, insurance brokers, florist, weekly market and much more. We are situated on Urbanizacion La Marina, there is also the La Marina village which is around five minutes in the car and is situated closer to the beach. In the village there are mainly apartments and it is generally more Spanish owned. Just along the road there is the area of El Pinet where you can purchase a brand new property next to the pine forest. It’s just a 5-minute walk to the beach. The nearest international schools are in Elche, Alicante or San Miguel. However the local schools are good and the children benefit from becoming bi-lingual at such a young age. Not really, there is crime but not as high as the UK. Prices have more or less stayed the same for the last couple of years. Brexit slowed things down for the British for a couple of months but it didn’t affect the European clients. Now the UK clients are ready to buy again. We think it is an excellent time to buy as prices are still approximately 50 percent of what they were at their peak. La Marina is an urbanisation of San Fulgencio the other urbanisations are San Fulgencio town (predominantly Spanish owned apartments), Marina Oasis (mainly villas with a mixture of Spanish owned villas built in the 1990’s and newly built villas owned by expats of all nationalities) and La Escuera (mainly villas on bigger plots and bigger price tags). How much are the typical property prices in La Marina for apartments, villas etc? There are no purpose built apartment blocks in La Marina itself so the cheapest houses are 1-bedroom ‘Josefinas’ that are 29m2 have a lounge, kitchenette, bedroom and bathroom and start around 40,000 euros up to 400,000 euros for a good size detached villa with a private pool. Somewhere in between you can buy a 3-bedroom quad style villa with access to a communal pool for 100,000 euros or a nice 3-bedroom 2-bathroom villa with private pool for around 250,000 euros. Any tips and advice to people looking to buy in La Marina or surrounding. Think about what you need. Is the property going to be a holiday home or main residence as things like outdoor space, storage room, kitchen worktop space, access to a pool could be important to you if you are looking for a ‘home’. Do you want to be closer to the beach or close to amenities? One part of the urbanization is hilly and you may not want to be walking uphill in the heat. Samantha, thank you so much for taking the time to help our readers with your experiences in Spain. If you want to contact her, you can find her details below. Here is an interesting tourist video on La Marina. La Marina Tourist Information – Page Summary – This page contains unique content about the beach resort of La Marina, a popular tourist destination on the southern Costa Blanca coast of Spain. Why do you show the photo of the wrong “La Marina” – with blocks of flats behind the beach? Is this the town near Valencia? Otherwise your details are very good general summary of a great part if Spain. Do you know of any local beaches where I can launch my small (3.5m) electric powered boat. I am a resident of Marina Urb. Hope you can help me! Muchas gracias. Rental of a 1 or 2 bedroom House or Bungalow. We would be pleased for any Help and Information.